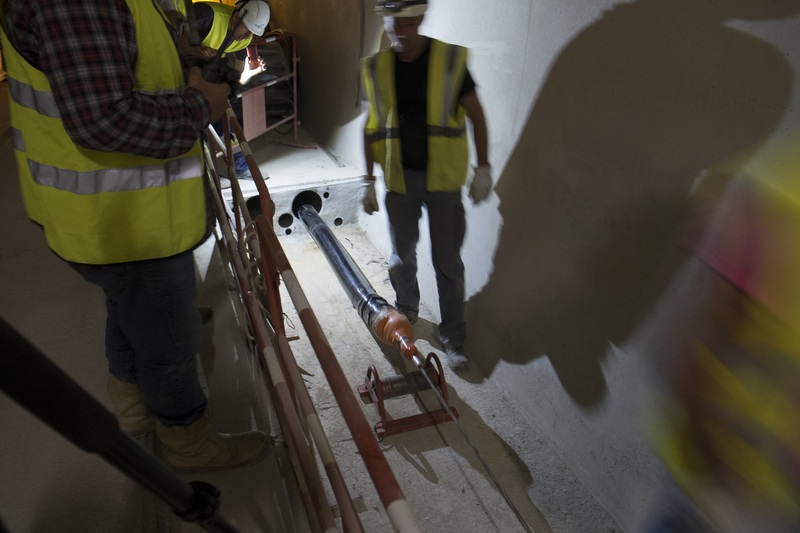 The underground electricity interconnection between Baixas (France) and Santa Llogaia (Spain) is a globally pioneering project. This project allowed the interchange capacity to be doubled from 1,400 to 2,800 megawatts (MW), while also increasing the security, stability and quality of electricity supply in the two countries as well as in the rest of Europe. The central part of the line crosses the Pyrenees at the Albera massif. An 8.5 kilometer tunnel was built for this section; 1 kilometer in Spain and 7.5 kilometers in France. The rest of the line is buried with the ditch system. Spain. On the Spanish side, the line crosses the Empordà through the municipalities of Santa Llogaia, Vilafant, Figueres, Llers, Pont de Molins, Cabanes, Biure, Capmany, Darnius, Agullana, and La Jonquera. For the most part, the layout is parallel to the AP-7 motorway and the high-speed rail. France. The suggested layout on the French side was the result of 15 months of consultations with representatives and associations from the region. The line passes through the towns of Baixas, Baho, Villeneuve-la-Rivière, Le Soler, Toulouges, Canohès, Ponteilla, Trouillas, Villemolaque, Banyuls dels Aspres, Tresserre, and follows the high-speed rail for most of its layout up to the tunnel entrance, in Montesquieu des Albères. The tunnel then goes under the municipalities of Le Boulou, Les Cluses, and Le Perthus. Baixas, with an expanse of 19 km² and part of the canton of Saint-Estève, has 2,217 inhabitants. For centuries it has been renowned for its bluish-coloured marble (used in several famed buildings, among them Washington’s Shrine of the Immaculate Conception) and for its wine of the same name (in fact, the town is surrounded by vineyards). The altarpiece of the Romanesque church of Saint Mary is the largest in France (17x12m). In addition, Baixas is home to the hermitage of Saint Catherine and fortifications erected in the 13th and 14th centuries. This town, located in the canton of Saint-Estève, has a population of 2,490 inhabitants and a surface of 8 km². Its San Vicente parish church was built prior to the 10th century (the first time it is mentioned in writing) and later fortified in the 12th century. Some remains of these fortifications can still be seen today. If you take a stroll through Baho, you will also be able to see a stone porch marked with the date of 1663. This town of 1,052 inhabitants and a small surface area (4 km²) is part of the canton of Saint-Estève. It hosts two monuments: the oratory of Our Lady and the Romanesque church of Saint John the Evangelist, completed in the 18th century. The latter’s interior represents a major heritage work. Le Soler, part of the canton of Millas, has an expanse of 10 km² and 5,825 inhabitants. Numerous churches and castles have been built throughout its history. At present there still remain fragments of the walls of its most recently-constructed castle (1143), some vestiges of the church of Saints Julian and Baselice (13th century) and the church of Saint Dominic (1554), made of stone and brick. Touloges, the county seat, has 5,396 inhabitants distributed over an expanse of 8 km². During the 11th century Toulouges was the scene of several Peace and Truce of God assemblies, whose provisions eventually extended throughout France. Their purpose was to reduce the violence then being committed by rival feudal barons in the area. This town’s cultural heritage includes a Romanesque church dedicated to the Virgin of the Assumption, whose oldest portion was built in the 9th century, and a neoclassic bell tower that rises in front of the church. This town of 4,349 inhabitants, located in the canton of Toulouges, covers an expanse of 9 km², it has recently undergone swift demographic expansion due to its proximity to Perpignan (prefecture of the Eastern Pyrenees and capital of French Catalonia). In addition, it is home to some curiosities that make it something special: a washing area which is still being used by some Canohès women, a church dedicated to Saint Cyrus and to his mother, Saint Juliette, and a Greek style funeral monument. This town in the canton of Thuir has an expanse of 14 km² and 1,827 inhabitants. The village of Nyls belongs to Ponteilla; consequently, the town has no less than three churches. Foremost is the Romanesque church of Saint Steven, along with the churches of Saint Andrew and Saint Mary. Ponteilla’s scenery also includes a fourth bell tower: that of an old tower build by the city council. In addition, in the Nyls area one can visit exotic gardens containing plants from all the continents. Trouillas, located in the canton of Thuir, is a medium-sized town (1,424 inhabitants and 17 km²). Its territory, almost fully dedicated to vineyards, is crossed by the river Canterrane and bound to the south by another watercourse, the Réart. In addition to its parish church, its territory includes medieval ruins of an ancient church known as Mas Deu, commissioned by the Order of the Temple. The small town (6 km²) of Villemolaque belongs to the canton of Thuir and has a population of 922 inhabitants. Viticulture holds a very important place in the town’s economic life. Villemolaque’s architectural treasures include mainly a Romanesque (portal) and gothic (cloister) style monastery, called Monastir del Camp, and a polychrome Romanesque wooden Virgin which dates from the 13th century. This Céret canton town has a population of 1,007 inhabitants and a surface area of 10 km². Nothing remains from the original town (Carolingian period); the oldest monuments in the town date from the 12th or 13th centuries. The parish church of Banyuls dels Aspres is of Gothic style and dedicated to Saint Andrew; the fortifications that surround it are quite impressive. Tresserre, located in the canton of Thuir, has a population of 637 inhabitants and a surface area of 11 km². Its cultural heritage is essentially religious: a Romanesque church dedicated to Saint Saturninus, a chapel to Saint Amancius and a polychrome Baroque wooden altarpiece from the 17th century. Montesquieu des Albères, a town in the canton of Argelès-sur-Mer, is home to 824 people. It covers an expanse of 17 km² located at the foot of the Pyrenees massif known as Albera. It is famed for the large number of water sources and springs which can be found there, throughout the course of numerous colourful footpaths. The town also has a feudal castle from the 11th century and a Romanesque church dedicated to Saint Saturninus. The town of Le Boulou, with an expanse of 14 km², belongs to the canton of Céret. It has more inhabitants (4,428) than the surrounding villages. It receives many visitors due to its spas, greatly-appreciated because of the therapeutic qualities of its waters. Le Boulou is crossed by the river Tech and is home to several interesting elements: a bell of more than 800 kg that dates from the 15th century, a quadrangular tower (a vestige of more ancient fortifications), the statue of Pierre Bayle (the first youth to fall officially for France in the battle of Le Boulou), without forgetting its Romanesque church in honour of Saint Mary. Along with its neighbouring towns, Les Cluses bears the mark of a Roman presence in Catalonia in ancient times. The town, which is part of the canton of Céret, has 219 inhabitants and an expanse of 9 km². The famous Via Domitia, a road constructed by the Romans to link Rome with the Iberian Peninsula, crosses Les Cluses. In addition, despite its name Château des Maures (Castle of the Moors) was also built by the Romans, before falling to the Saracens, who ultimately lost the fort to Charlemagne’s army (9th century). The town also features a Romanesque church erected in honour of Saint Nazarius. With a very small surface area (4 km²), this village in the canton of Céret has 620 inhabitants and the peculiarity of being astraddle the French-Spanish border, although Le Perthus is completely French. The town, visited every day by 70,000 tourists during the busy season, is an important lynchpin between France and Spain. Just as with La Jonquera in Spain, Le Perthus hosts an immense border shopping centre. Its principal monuments are the fort of Bellegarde, built in the 17th century to defend the port of Pertús, and the ancient ruins of Panissars, which still show vestiges of the foundations of Pompey’s triumphal arch erected to commemorate his victory against the Spaniards. Located in the Northern end of the Alto Ampurdán region, this town of little more than 3,000 inhabitants is right on the border with France. The municipality’s 56,93 km² surface area covers art of the Albera Mountains, a natural site of immense scenic value. The town’s life revolves around activities related to the border, especially in terms of trade. The municipality still has a good number of Romanesque hermitages and castles, such as those of Requesens, Rocabertí and Canadal. With a population of a little moran than 800 inhabitants and an expanse of 27.72 km², this Alto Ampurdan municipality us contiguous with the neighbouring region of Vallespir, in France, through the La Manrella pass, where a monument dedicated to Lluis Companys, president of the Catalan government during the second Spanish republic, can be found. This town is highlighted by its church of Saint Mary, built at the end of the 12th century and by the megalithic remains which is still contains. Agullana had an important tradition in the cork industry, with more than 40 factories dedicated to its manufacture at the beginning of the 20th century. Today there are major modernist buildings from that age of splendour that can still be seen. Its population barely exceeds 400 inhabitants and its surface area is of 35 km². Highlighted is the Boadella marsh, the principal water reserve for the Alto Ampurdán region. Its economy today revolves around tourism. The municipality still displays megalithic menhirs and dolmens, as well as a church dedicated to Saint Mary, quite similar to the one in the neighbouring town of Aguallana. One of its illustrious natives is the writer Josep Maria Gironella, author of Los cipreses creen en Dios (The cypresses believe in God). Located in the Alto Ampurdán region, Capmany extends over 26 km². With a population of a little more than 600 inhabitants, the municipality is today one of the region’s principal wine-growing centers, with more than twenty private wineries producing under the Empordà name. As part of its wine-growing tradition, one of its feature attractions is its faucet museum, with more than five thousand pieces. As well as many of the region’s other municipalities, it still retains important megalithic remains. With a population of a little more than 200 inhabitants and a surface area of 10 km², this is one of the smallest towns in the Alto Ampurdán region. The municipality still preserves the remains of the Biure castle, highlighted by a monument to Pierre Bayle, a French drummer boy who died in the battle of Montroig at the age of 11. The building currently housing the city council contains an ancient oil press. Located right in the heart of the Ampurdán plain between the Muga and Llobregat rivers, this town of 915 inhabitants and a 60 km² surface area stands out due to the fertility of its earth, dedicated mostly to agriculture. Cabanes still retains a medieval tower, the last vestige of its old castle, a cylindrical Romanesque-style building ten meters in height. This is a small Alto Ampurdán town with 500 inhabitants, located midway between Girona and Perpignan- it has an expanse of 9 km². It offers a broad supply of gastronomical treats and still preserves major architectural remains, such as the ancient bridge which crosses the Muga river or the medieval fortifications of Montmarí and Molins. With 1,172 inhabitants and an expanse of 21 km², Llers is only 5 kilometres from Figueras, the regional capital. The municipality is home to an important historical heritage, which includes the castle of Llers, the church of Sant Quirze d´Olmells and the Rissec natural site. With almost 45,000 and a 19 km² expanse, Figueras is the administrative capital and business centre of the Alto Ampurdán region. The city is fame for being the site of one of the most-visited museums of the country, the Dalí Museum, but it also has a toy museum, another one of the region´s benchmarks, Added to its attractions as a business centre are its vast array of gastronomical samplings and a host of cultural activities. Its proximity to the city of Figueras has made this one of the fastest-growing towns in the Alto Ampurdán region, with a population of 5,429 inhabitants and a surface area of 8 km². Vilafant still retains the remains of the old nucleus of Palol Salbaldòria, an archaeological complix of great value. The high-speed train has a station within its municipal limits. Despite having only a 2 km² expanse and 325 inhabitants, this municipality had a great artisan tradition, especially with reference to the processing of cane, due to the abundance found in the Àlguema brook. Santa Llogaia is the point where the electrical interconnection with France begins, and also where the transformer substation on the Spanish side will be located. Its nucleus is highlighted by an 18th century church. The France-Spain interconnection power line passes through the Alberas massif of the Pyrenees mountain range via an 8.5-kilometer tunnel that runs parallel to that constructed several years ago for the high-speed railway line. The construction work was carried out by the HVDC consortium (Eiffage, Dragados, Arcadis, Sener and Setec). The excavation was carried out by two boring machines working from both ends of the tunnel. The north entrance is located in Montesquieu-des-Albères (Pyrénées Orientales Department) and the south entrance at La Jonquera (Girona Province, Spain). 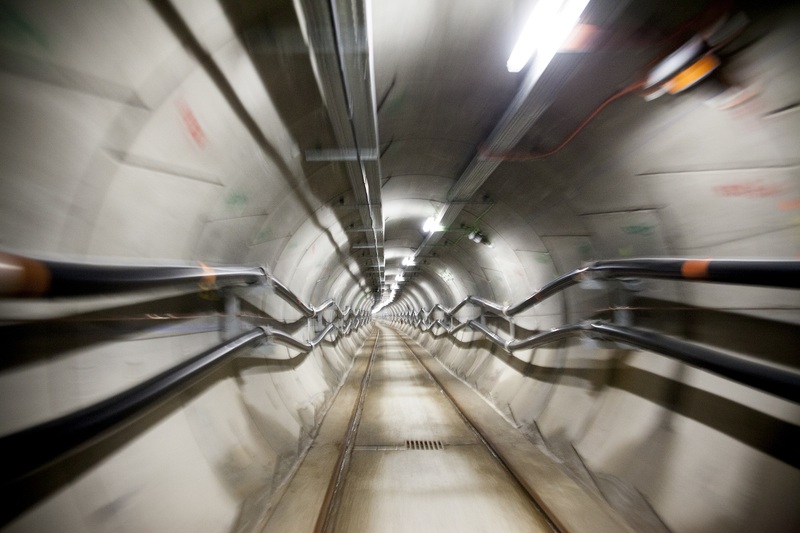 In March 2012, the Albera boring machine took its first “bite” into the Pyrenees Mountains from the La Jonquera side in order to meet its French “twin”, Canigó, which had begun tunneling a few months previously in Montesquieu-des-Alberes. The meeting of these two machines, each 250 meters in length and weighing 780 tons, was celebrated on April 22, 2013, barely a year later. The excavation of this 8.5-kilometer tunnel had finally ended. 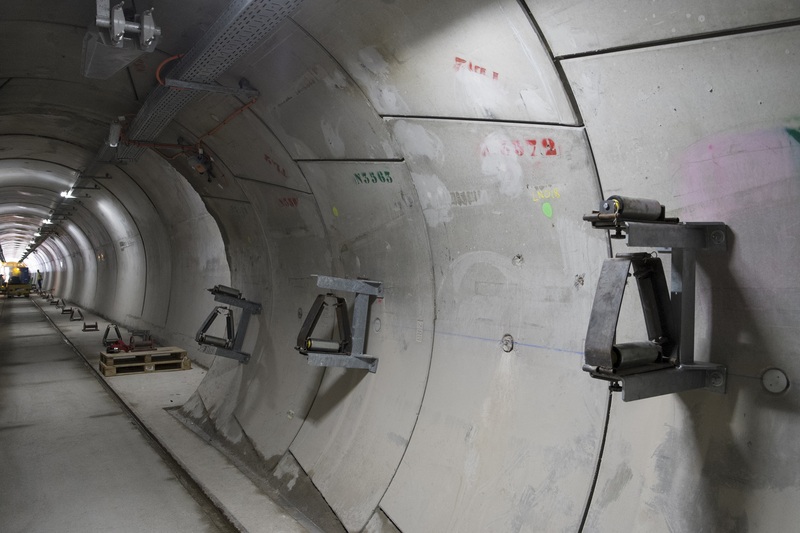 Designed for this project by the German company Herrenknecht, the boring machines were equipped with a rotating cutterhead (with a diameter of 4.3 m), a double shield allowing them to advance through the mountain and a fully operational erector to ensure that the machines operated properly. At a "cruising" speed of 23 meters per day, both Canigó and Alberas had to bore through granodiorite, schist, granitoid, gneiss and miocenic rock. The rock on the French side of the border was more crumbly than that on the Spanish side (more granitic), which made the boring trickier and slowed the boring machine’s progress. The excavation material removed from the tunnel was calculated to be approximately 120,000 m3. In keeping with its commitment to the environment, Inelfe decided to reuse this material for the A-9 highway extension project in France. The interconnection between Baixas and Santa Llogaia consists of two 1000 MW, ±320 kV links that run in two parallel 64.5-kilometer trenches (26 km in France, 30 km in Spain and 8.5 km through the tunnel that pierces the Pyrenees). The total width of the two trenches, including the space separating them, is three meters, while their depth is 1.5 meters. Excavation of the trenches began in July 2012 on the French side and in September of the same year on the Spanish side. In order to avoid the more serious geographic obstacles, it was necessary to drill 37 times, sometimes in especially difficult areas such as with the Tech River, under which the line passes at a depth of 14 meters. Also, in order to guarantee maximum safety and limit the work’s impact, a unique strategy was developed. The trenches, once excavated, were filled the following day after the cable conduits and concrete were laid. 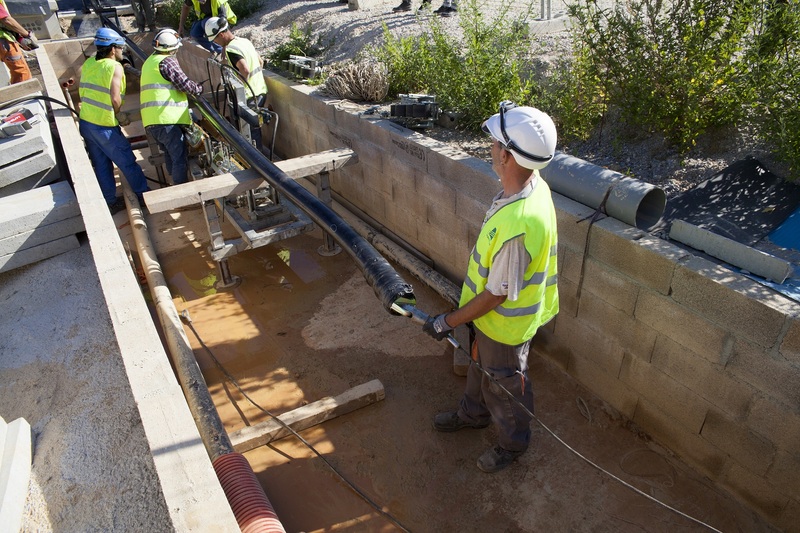 At an average rate of 200 meters per day, excavation of the trenches reached its end in France in October 2013 and in the beginning of 2014 in Spain. The line consists of four parallel cables. Cable selection was another distinguishing feature of the project. 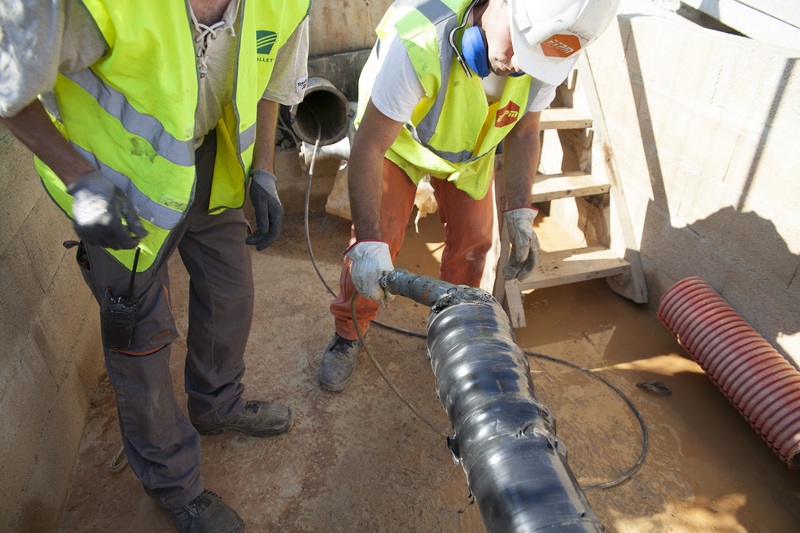 The cable’s insulation was not oil-impregnated paper, as is often the case with submarine cables for example, but rather a dry insulation made of cross-linked polyethylene (XLPE), a material better suited to the power line’s technical specifications. Cable laying began in April 2013 on the French side and a few months later in Spain, and was finished in the middle of 2014. 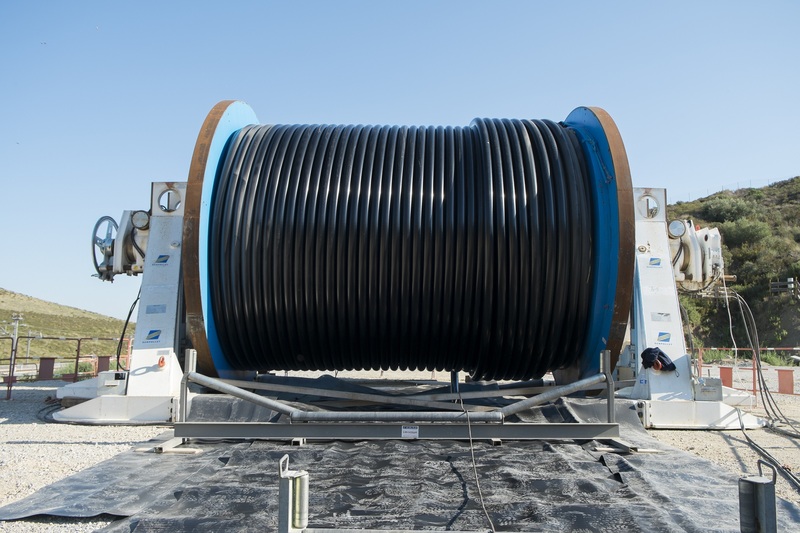 260 kilometers of cable was needed, transported by road on imposing spools weighing between 42 and 83 tonnes using 9-axle and 72-wheel tractor trailers. To unite the various sections along the route, 144 cable joints were created, a delicate and laborious process. These joints connecting the two adjacent sections consisted of a type of prefabricated sleeve that had to be installed in a completely controlled environment by highly specialized technicians. The construction work was an exemplary demonstration of cooperation between various teams working simultaneously on different sections in order to adhere to the agricultural and environmental restrictions as well as the work hours agreed upon with the landowners and farmers. Due to its technical specifications, (underground line 64.5 km long) and to reduce electrical losses during its transmission underground, the France-Spain interconnection operates using direct current instead of the alternating current used for the rest of the network. This entails the use of a device for converting the electric current at each end of the line. Converter stations thus had to be constructed in both Baixas and Santa Llogaia. Each converter station is comprised of several large buildings covering a total surface area of 4 hectares. Two main buildings house the power units, which constitute the main devices for converting alternating current into direct current after massive converter transformers bring the alternating current to the appropriate voltage level. Two smaller buildings house the control equipment. The converter stations were designed to blend in with the surrounding landscape as much as possible in order to achieve equilibrium between functionality and environment. The roof of the Baixas station was specially designed by an architect. It rises 17 meters in height while that of Santa Llogaia reaches 25 meters. Each station consists of two main buildings 17 meters in height that house the power units (the AC to DC converters), seven transformers weighing more than 250 tonnes (whose transport from Germany required special logistics) and an air cooling system. Two smaller buildings house the control equipment. Construction work began in January 2012 on the Spanish side and shortly thereafter on French side. Work was completed in the middle of 2014. VSC (Voltage Source Converter) technology was used to convert the direct current into alternating current (and vice versa). This is a very new and innovative technology that speeds up current conversion in both directions while making it easier to restore the supply of electricity after a power failure. VSC technology had already demonstrated its efficiency and effectiveness, but it had never been used for an electrical link with the power of the Santa Llogaia-Baixas interconnection, which represents a technological world-first. One of the objectives of Inelfe, in both the project’s design and construction phases, was to minimize the interconnection’s impact on the surrounding environment. The first measure, though very costly, required that the line be buried and a tunnel excavated through the Pyrenees Mountains in order to preserve the forested slopes of the Alberas massif. Between the end of 2008 and the beginning of 2010, the project was subject to public debate and a consensus process in France. RTE brought together the region’s mayors, landowners and associations in order to provide them with information about the interconnection, seek their advice and come to a consensual agreement as to what route it would take. The process was carried out in two phases. The first phase addressed aspects related to the direct current, magnetic fields, the underground line and the environment. The second phase was organized around four workshops aimed at analyzing all the terrain features in order to determine the definitive route for the line. In agreement with the various administrations and the citizens themselves, RTE committed itself to 190 preventive and corrective measures and actions aimed at reducing the route’s environmental impact. This includes respecting the areas protected by the Natura 2000 network, abiding by the Water Framework Directive and acting to preserve the habitat of protected species. At the end of 2010 in Spain, the project obtained the Environmental Impact Statement, a mandatory report from Spain’s Ministry of the Environment ensuring that all environmental requirements have been met. In addition, a consensus was reached with the mayors of the affected municipalities regarding the project, with 97% of the landowners’ expressing their consent. When defining the interconnection’s route, the designers tried to take maximum advantage of pre-existing infrastructures such as the high-speed railway and highways. And very importantly, the design showed special care not to affect indigenous forest areas or places of public interest (streams, easements) and to respect the biological sanctuaries of the nutria, lesser kestrel and Hermann’s tortoise. Hydrogeological monitoring of groundwater as well as surface water was performed in order to make sure that the Alberas massif’s water resources are specifically monitored and that the modern drilling techniques used to pass under the principal rivers did not affect their flow volume or water quality. Drilling below the Tech River was particularly complex. Inelfe, in accordance with its commitment to respect the habitats of both the flora and fauna, recreated the living environments of certain animals such as the Spanish pond turtle since the interconnection’s route passes over their long-established territories. An artificial lake was also created for the Hermann’s tortoise, and some specimens have been tagged in order to track their progress within their new habitat. With such large-scale construction work, generating excavation materials and debris was inevitable. Inelfe found it indispensable at all times to reuse these materials and debris to restore the landscape and its existing paths and roads. And so they did. For example, the vegetation removed during the construction of the converter station in Santa Llogaia was used to restore the area around the tunnel’s entrance. And the vast majority of the materials left over (120,000 m3) from boring the tunnel was used for the A-9 highway extension project in France. INELFE gave top priority to local companies for ancillary work on the site, nearly always in collaboration with the region’s municipal governments, such as Rosellón and Girona. At least 95 jobs were created in the south of France thanks to the 37.8 million euros earmarked for the small businesses associated with the project. A similar number of jobs were also created in Spain. When hiring directly, social groups with professional insertion difficulties were taken into account. On the Spanish side, for example, all the ancillary installations inside the tunnel were carried out by companies working in conjunction with the Associacíon de Disminuidos Psiquicos (association for the intellectually disabled), which demonstrates how the investment made in the region with the construction work also contributed to its development. “The Electrical Crossing of the Pyrenees” is the title of a research project carried out by Renan Viguié concerning electrical interconnections between France and Spain from the period between the wars to the present day. It is the first time that the crossing of a border by an electrical current has been the subject of a historical study, which is both summarised and detailed. •	The new electricity infrastructure, 64.5 km in length, has represented an investment of 700 million euros and will double the interconnection capacity between the two countries. 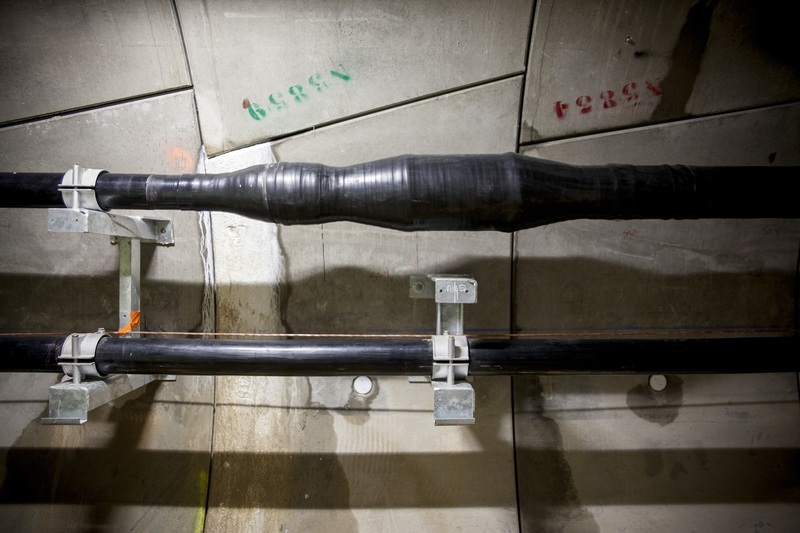 The cables through which the electricity will travel between France and Spain are already “winding” along the interconnection tunnel that links both countries. The installation was completed at the end of October and entailed a very meticulous and precise process. To unwind the cables and place them in the supports inside the tunnel, the technique of “snaking” was employed. This is a sinusoidal motion, similar to a snake, which gives the cable a sufficient curvature to easily absorb the expansion caused by the current flow. After two years of work, the excavation of the trenches for the new electrical interconnection between France (Baixas) and Santa Llogaia (Spain), as well as the construction of the converter stations, was completed this summer. 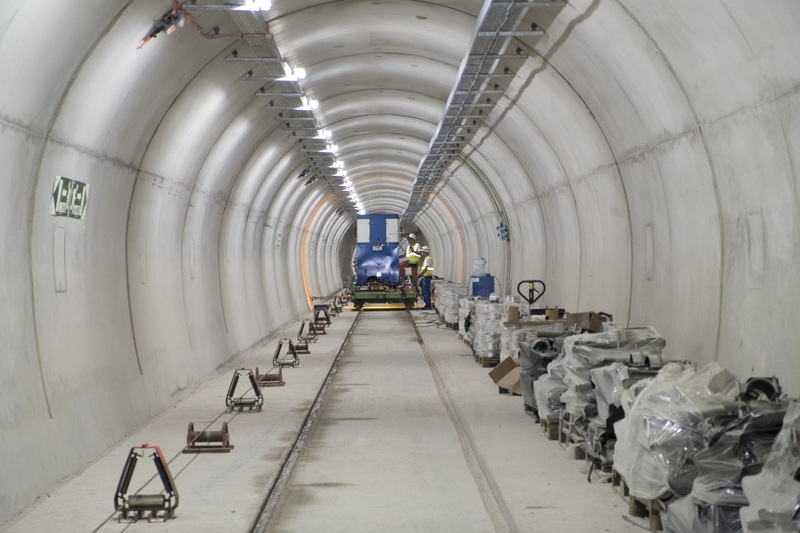 The work being carried out to lay the power line cables for the new electrical interconnection between France and Spain has reached the tunnel that crosses the Pyrenees through the Albera massif. Around 9.00 am on 31st July, 28 specialised workers guided the threading of the cable through the pipes in the trenches at the entrance of the 8.5 km tunnel. 34 km of cable will be required for the tunnel. The cable was deployed at a speed of 12 metres per minute. At the end of the day, 150 metres of cable had been released. 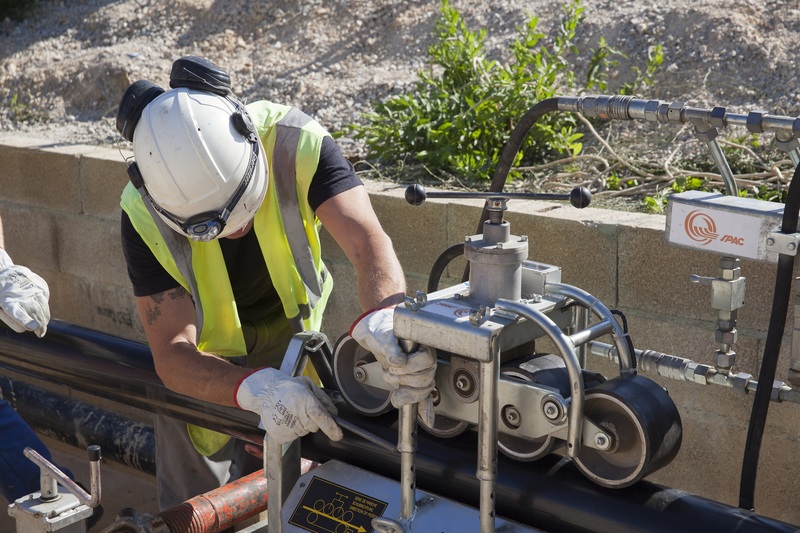 The cable laying is the penultimate stage of a gigantic project, which will double the electrical interconnection capacity between France and Spain. The 28th Castillo de Peralada Festival (Peralada Castle Festival) starts today, the most important event of the summer in southern Europe when it comes to opera, dance and classical music. Renowned international artists such as Piotr Beczala, Sonya Yoncheva, Gérard Depardieu, Anouk Aimée, Tamara Rojo and the English National Ballet, Jonas Kaufmann, Sara Baras, Josep Maria Flotats, Xavier Sabata and Ángeles Blancas will be appearing at the festival, which finishes on 16th August. Work on the tunnel that will house the electrical interconnection between France and Spain was completed today, as the Spanish TBM Alberas pierced the final wall of rock to meet up with its French counterpart Canigou beneath the Pyrenees. The now fully excavated tunnel runs for 8.5 kilometres alongside the high-speed rail tunnel, between the villages of La Junquera in Spain and Montesquieu-des-Albères in France. It will act as the conduit for a 320,000-volt line, linking the French and Spanish power grids with minimal environmental impact.